AETA Audio Systems introduces ScoopTeam, a codec designed specifically for live radio and TV sports coverage. 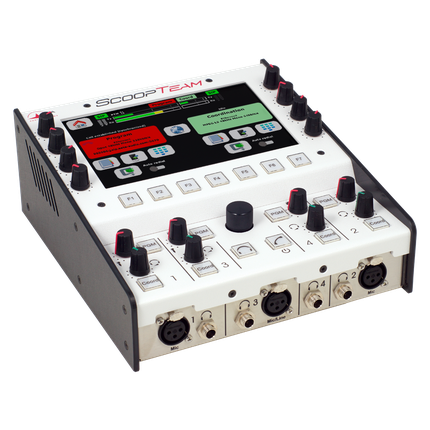 The ScoopTeam commentary unit incorporates a double mono codec for live transmission of one or two high-quality audio signals (up to 20 kHz bandwidth). It offers four commentary positions and up to 11 audio inputs. The two audio channels can be set with a single destination (transmission in “dual mono” format), or two separate destinations (double codec). ScoopTeam mainly uses IP networks, but can also operate via ISDN. Alternative transmission modes are available as options, including AoIP over 3G/4G, Wi-Fi via USB and mobile voice (including HD Voice capability). In addition, the premium version allows users to interface with RAVENNA/AES67 networks and offers two additional analog inputs and one AES input. The unit features an easy-to-use interface, which lends the operator total control of routing and monitoring with assignable buttons and knobs for settings and volume adjustments.